ACCOUNTS THAT DON’T JUST PAY BILLS. THEY PAY OFF. PERSONAL CHECKING ACCOUNTS THAT HELP YOU START STRONG. BUNDLING ACCOUNTS WILL WARM YOU UP TO SAVING. With our YourStart® Checking and Savings combo, you have more freedom and less fees with complimentary nationwide ATMs and mobile banking with mobile deposit.4 Plus, enjoy unlimited check writing and a welcome box of checks (with 30% off future check orders)! You can avoid a monthly $10 service fee if each month you have 12 debit card transactions and one direct deposit or automatic payment (ACH) post and clear during the statement cycle. The YourStart® bundle features a savings account that earns premium interest rates on the first $15,000, currently 3.00% APY.5 As long as your savings balance is at least $50, you can avoid a $3 monthly fee. You’ll also enjoy four free of charge withdrawals per month ($2 per excess withdrawal). NOT JUST ANOTHER ACCOUNT NUMBER. CHECKING FEATURES THAT COUNT. Take advantage of checking made easy with no monthly fee, complimentary online statements and unlimited check writing. Do you prefer paper statements with images? If so, FNB’s Great Start Checking lets you review your statements your way with a low $3 monthly fee that is waived if you are age 55 or better. Get even more benefits by being a club member. With a small monthly membership fee of $7, just $5 if age 55 or better or complimentary for active and former members of the US Military (one per military member). With Your Club Checking, you’ll enjoy club checks, unlimited check writing, paper or online statements, money orders, cashier’s checks and one small safe deposit box (where available). You deserve checking that makes managing money an easy A. Get more out of your bank from the start with no monthly fee and a welcome pack of checks. You’ll also benefit from our mobile banking app with complimentary mobile deposit as well as up to five free nationwide ATMs per statement cycle.4 You can write up to five checks per statement cycle at no cost ($0.50 for each additional check) and get complimentary online statements. At FNB we believe in second chances. Apply for Start Again Checking even if you’ve been turned down for checking accounts in the past. This account has its own requirements including $100 minimum opening deposit with no minimum balance required. Direct deposit preferred and required if offered by employer or government agency. $10 set up fee and $12 monthly service fee. 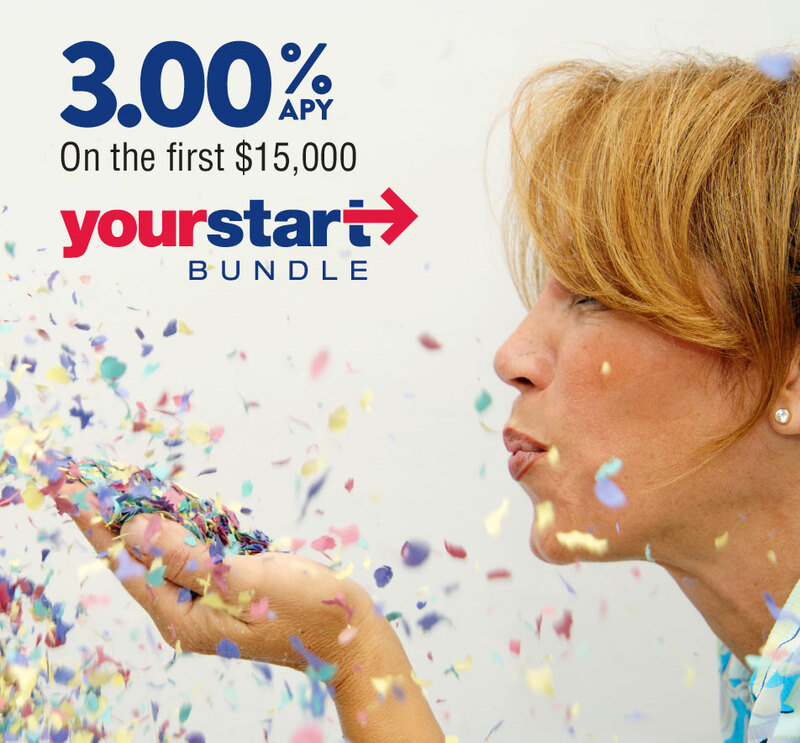 1YourStart® is only available as a bundle; the checking and savings each require a $50 opening deposit. Start Again Checking requires a $100 opening deposit. 2The mobile app is free, however, message and data rates may apply. 3Paper statements are free for Your Club Checking. They can be added to any other account for $3 per month. 4For ATM fees of $5 or greater, ATM receipt(s) must be presented for reimbursement. ATM fees are unlimited on YourStart Checking and will be reimbursed at the end of each statement cycle. ATM fees (up to five) on Best Start Checking will be reimbursed immediately. Mobile banking is required for mobile deposit. The mobile app is free, however, message and data rates may apply. 5YourStart® Savings is only available with a YourStart® Checking account and only one YourStart® Bundle allowed per primary account holder. Annual Percentage Yield (APY). For balances over $15,000.00 a standard rate of .15% APY will apply. APY information is accurate as of March 1, 2019, is subject to change and may change after account opening. Interest rate applies to YourStart® Savings only. Fees could reduce earnings on account. 6Checking account must have FNB debit card. If the account is closed before the matching funds are paid, the matching funds are lost. There is a $250 maximum match per year. Dollar for dollar match for the first three months limited to one per primary account holder. All matching funds transferred to the savings account at the end of each calendar year.